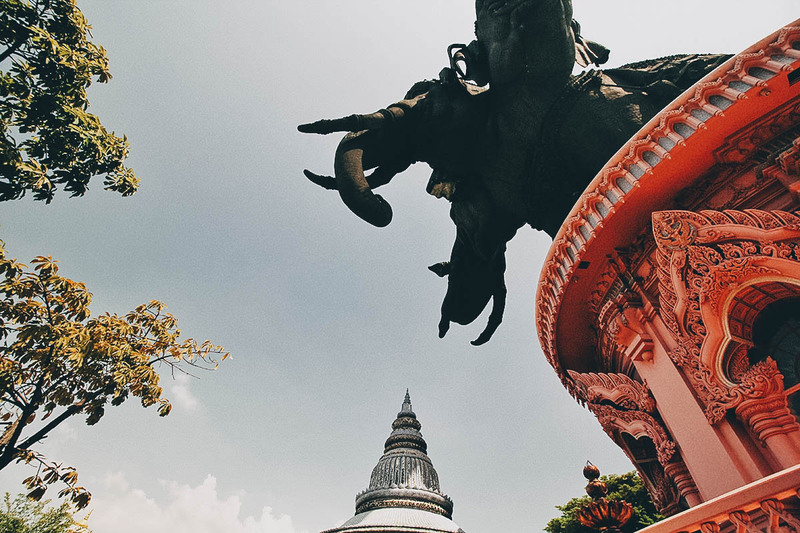 If you’ve traveled to Bangkok, then you’ve probably been to the must-see landmarks in the Old City like The Grand Palace, Wat Phra Kaew, Wat Arun, and Wat Pho. 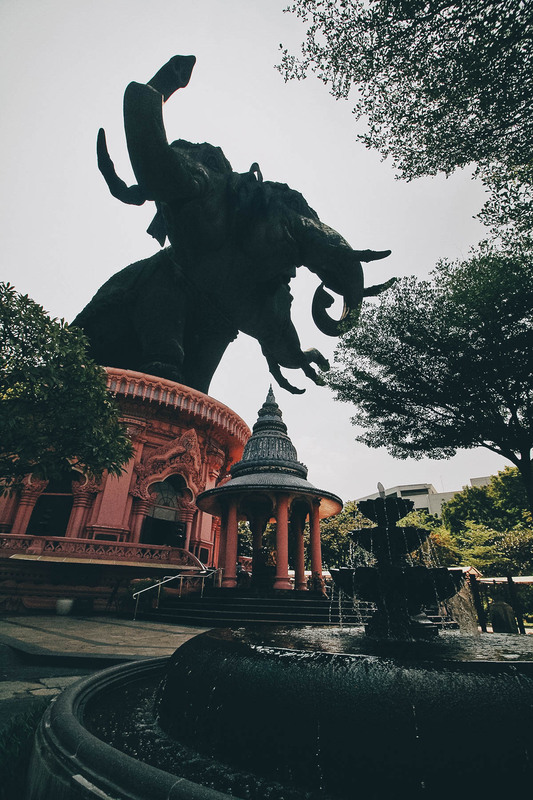 But have you heard of this museum that’s home to a colossal bronze statue of a three-headed elephant? 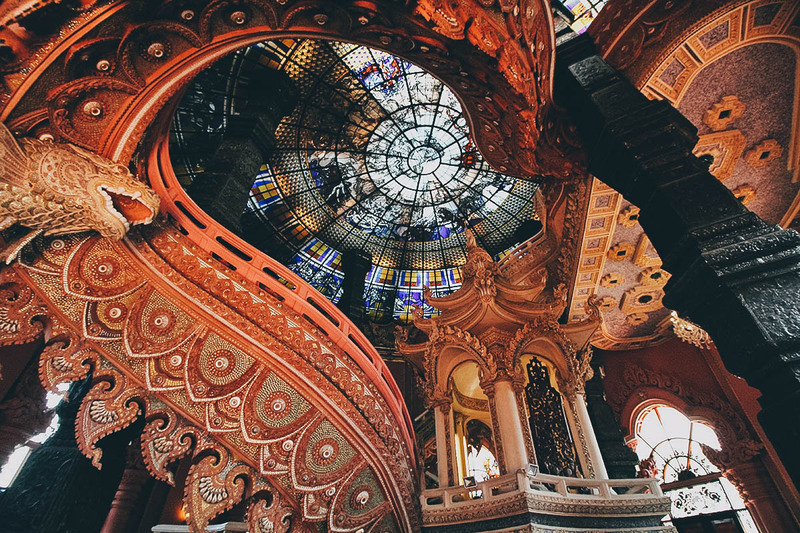 Known as the Erawan Museum, it’s one of the more unique and interesting museums you can visit in Bangkok. I’m drawn to unusual places. When doing research for our Bangkok trip, this museum naturally caught my eye. 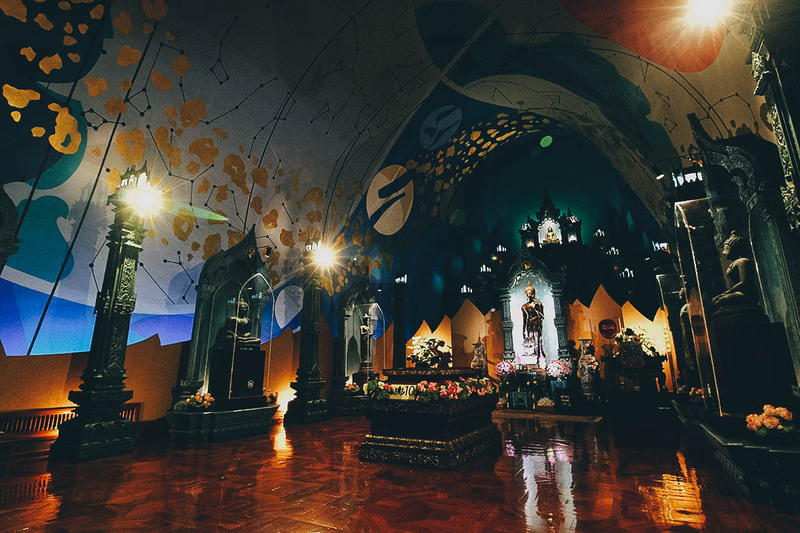 It stood out from the usual tourist circuit not just for its giant statue, but for its intricate carvings and beautiful stained glass ceiling. I had to add it to our itinerary. 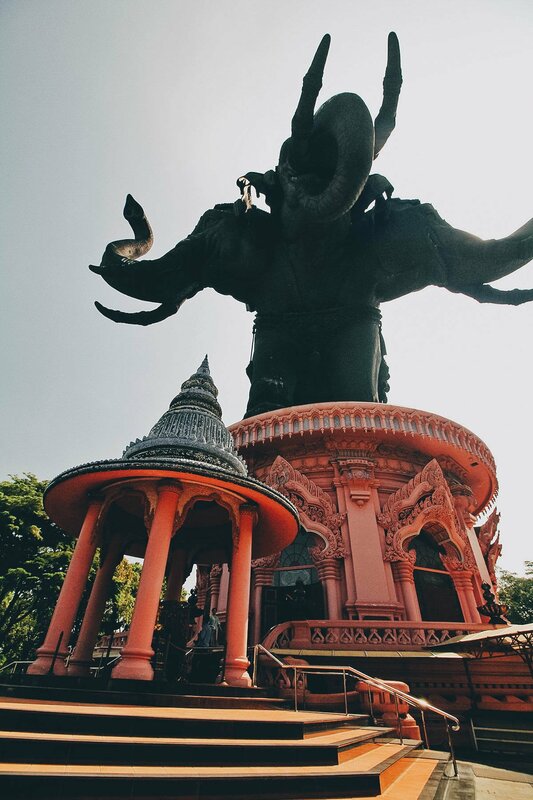 From its pictures on the web, I knew the elephant statue would be big. But you have no idea how big it really is until you’re actually there, standing beneath it. I was so taken aback by its size that I let out an involuntary “Whoa!” the moment it came into view. Trust me, when I say this statue is colossal, I do mean COLOSSAL. It’s absolutely massive. Scroll down and see for yourself. 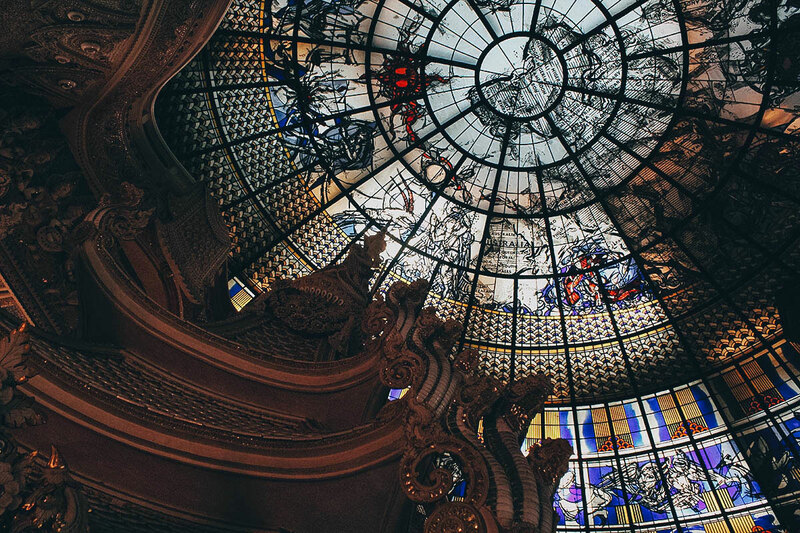 Erawan Museum houses a small collection of antiquities and religious artifacts belonging to Khun Lek Viriyapant, the museum’s owner. Though it’s labeled as a “museum”, it doesn’t feel like your typical museum. 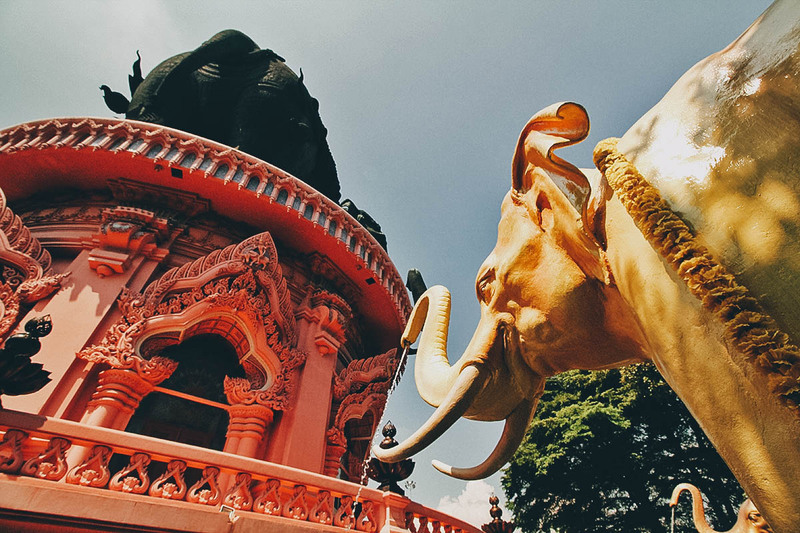 It does have a few religious and cultural artifacts but it feels more like an open air exhibit of statues and shrines with a giant three-headed elephant as its centerpiece. Made of bronze, the statue weighs a mammoth 250 tons and measures 29 meters high (95 ft) by 39 meters long (128 ft). It stands on a 15 meter high pedestal (49 ft) which houses the three-storey museum. 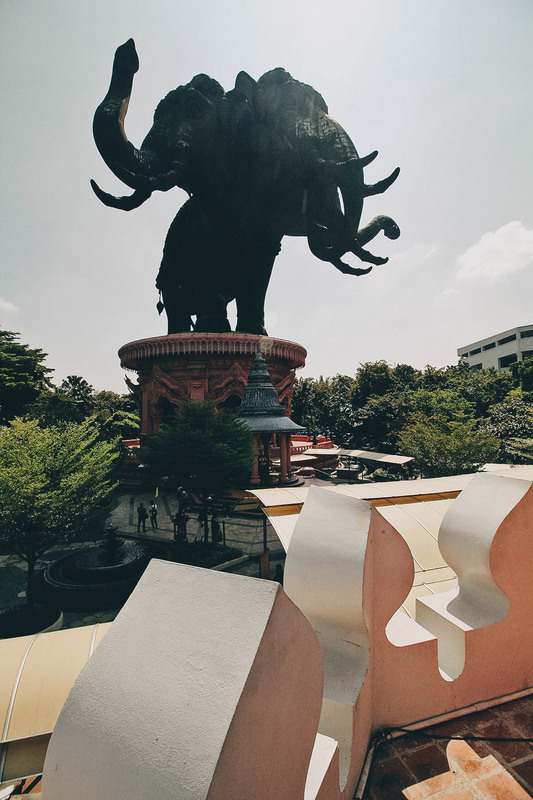 Modeled after the Hindu representation of the universe, the first floor of the museum represents the Underworld, the second floor symbolizes Earth, and the top floor, which is located within the belly of the elephant, represents Heaven. 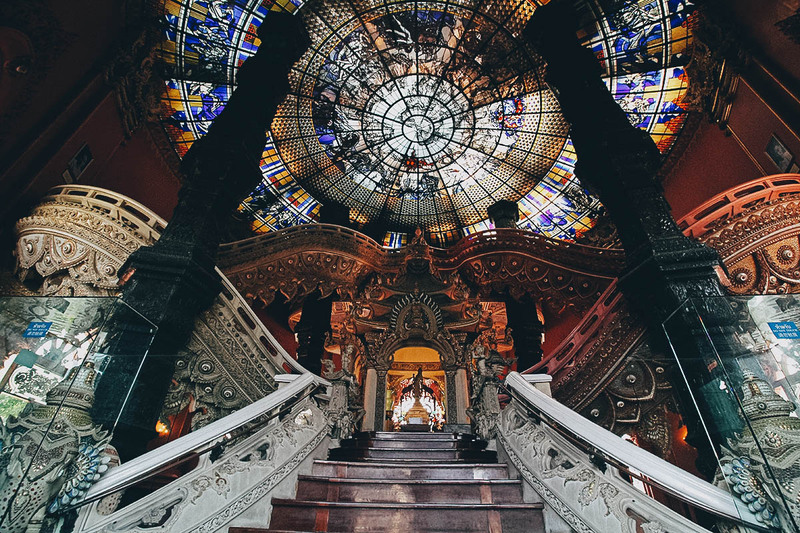 Though accessible from Bangkok, Erawan Museum is technically not in the capital city. 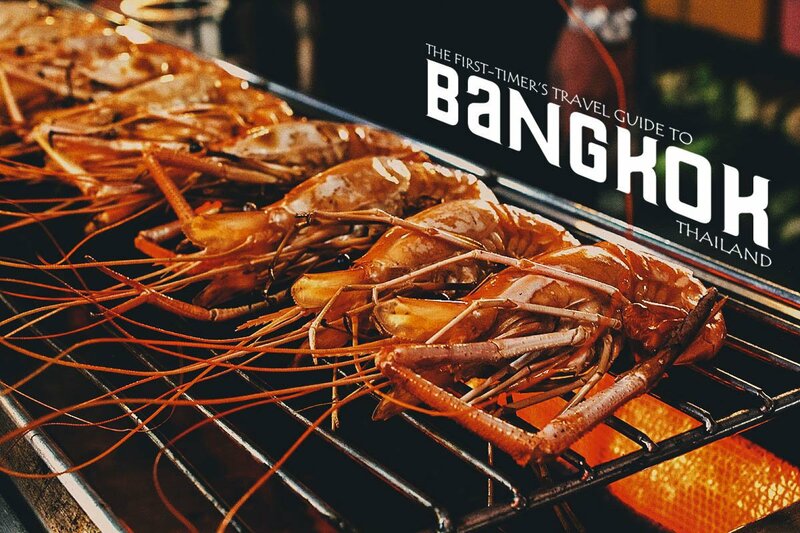 It’s located a little south, in Samut Prakan, but you can easily get there by BTS SkyTrain. You can take the SkyTrain to Samrong Station, which is the last stop on the Sukhumvit line, then hop into a taxi or Uber/Grab to the museum. Entrance to the museum is THB 400 for adults and THB 200 for kids. Free audio guides in multiple languages are available. This is the first thing you see when you enter the pedestal or museum proper. Pretty striking isn’t it? The carvings throughout the entire space are incredibly intricate, as is that stained glass ceiling. There are two spiral staircase on either side which take you up to the second floor. 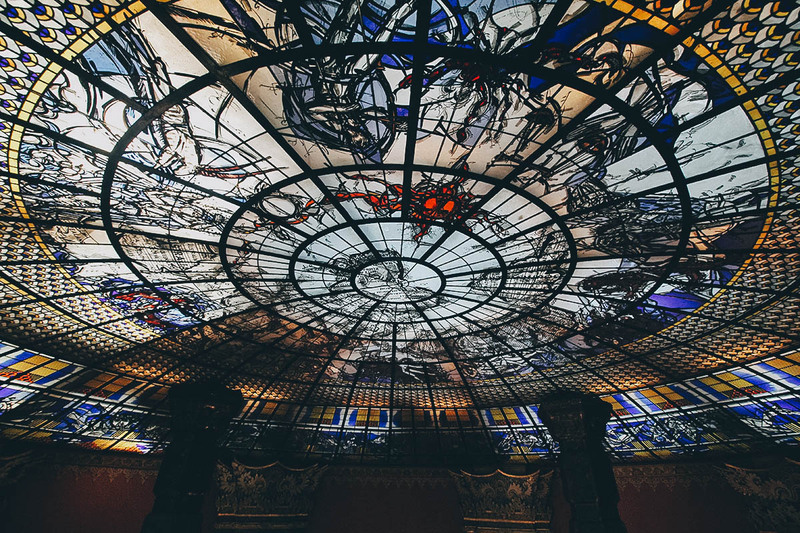 As described above, the first floor of the museum is meant to symbolize the Underworld. I guess if you understand these symbols, then you can see that represented in these elaborate carvings. 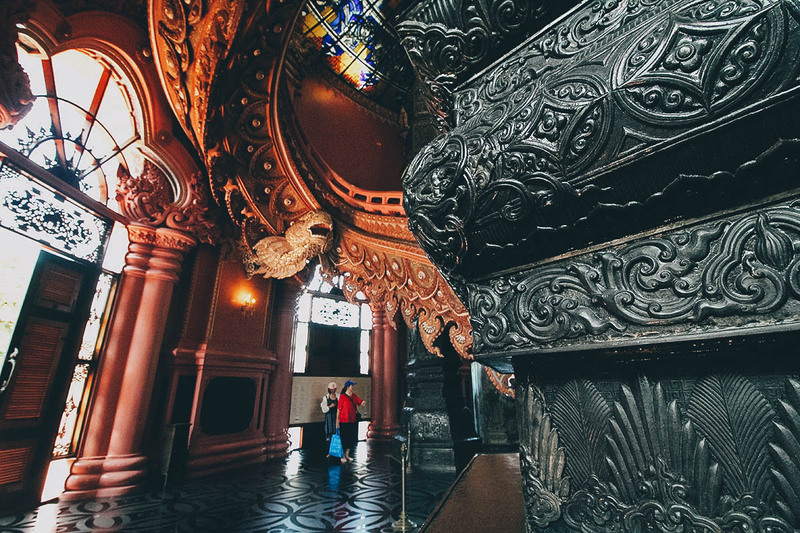 The staircases look like twin dragons with bodies embedded with eyes. Beautiful but kinda creepy. 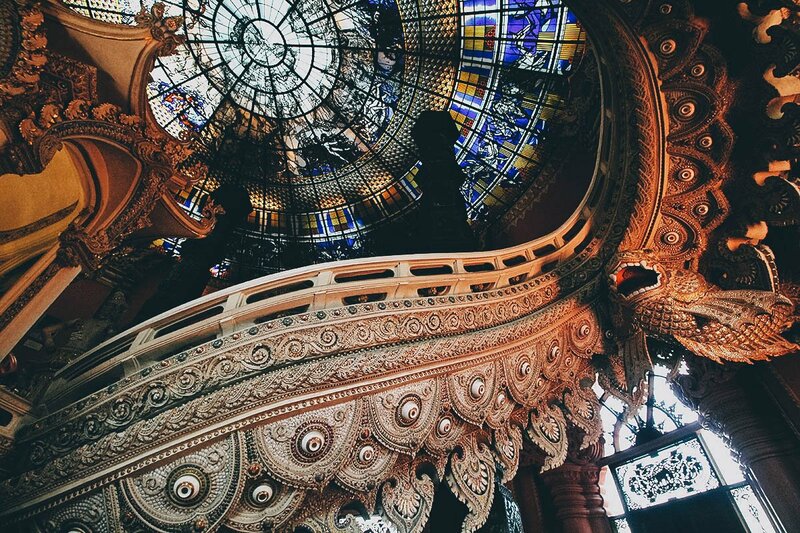 The amount of detail in this space is mesmerizing. 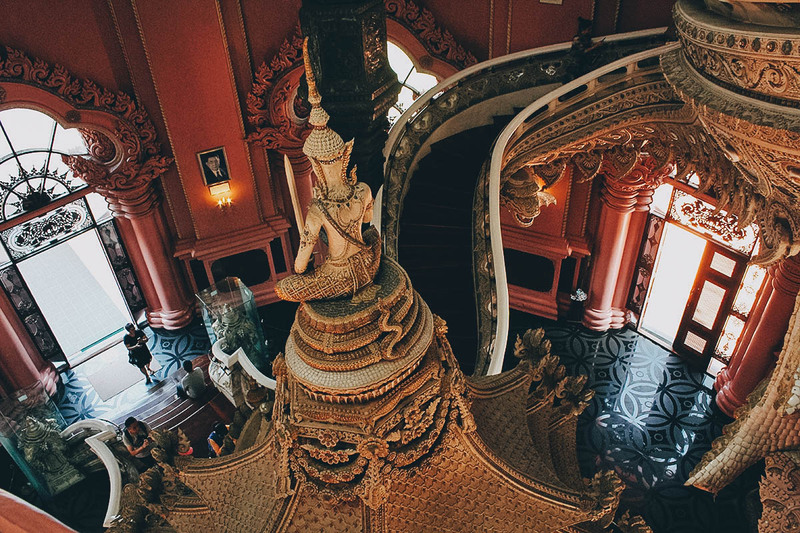 There are shrines and statues on the landing leading up to the second floor. This is the view from the second floor. I’m on Earth looking down at the Underworld. Hello Underworld. 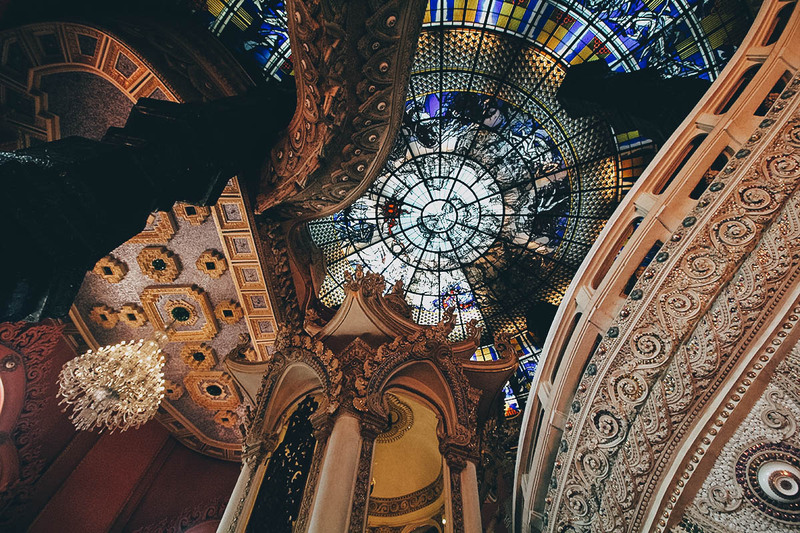 A closer look at that beautiful round stained glass ceiling. I suggest getting an audio guide when you’re here. It may explain what all these symbols mean. Here’s the top floor which is meant to represent Heaven. 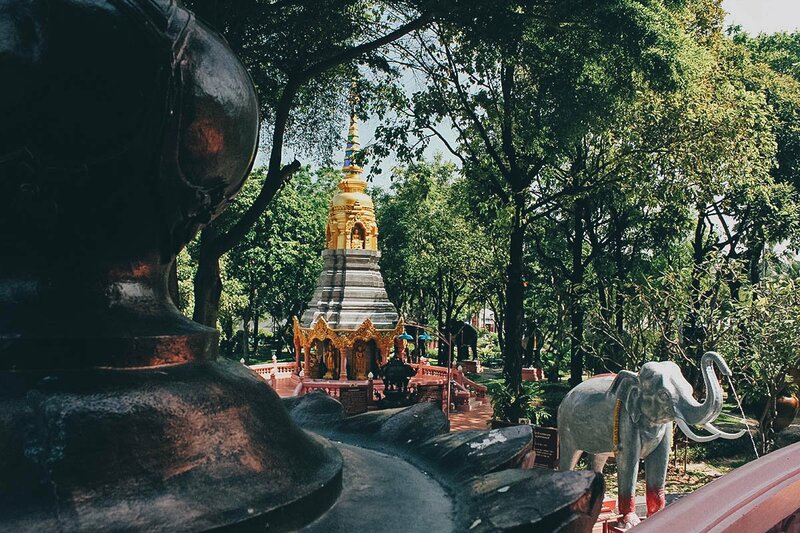 You can get here by climbing a narrow spiral staircase (through one of the elephant’s legs I believe) or by taking the elevator. Again, availing of the free audio guide may help explain what all this means. 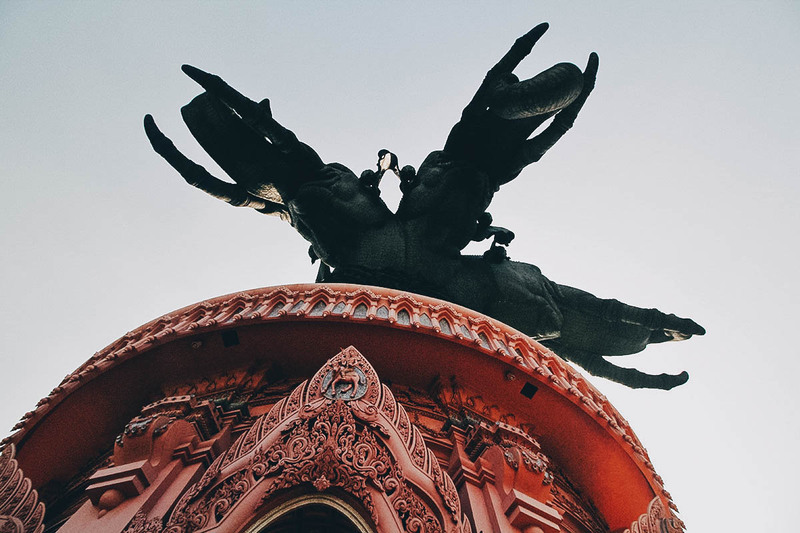 As beautiful as the carvings are, this bronze statue is the biggest draw at Erawan Museum (pun intended). It’s the main reason why people come here. I know it doesn’t look that big in this picture, but wait until you see it in the last one. From what I understand, Ganesha doesn’t actually have three heads. The multiple heads are only meant to symbolize an omnipresent or all-seeing god. 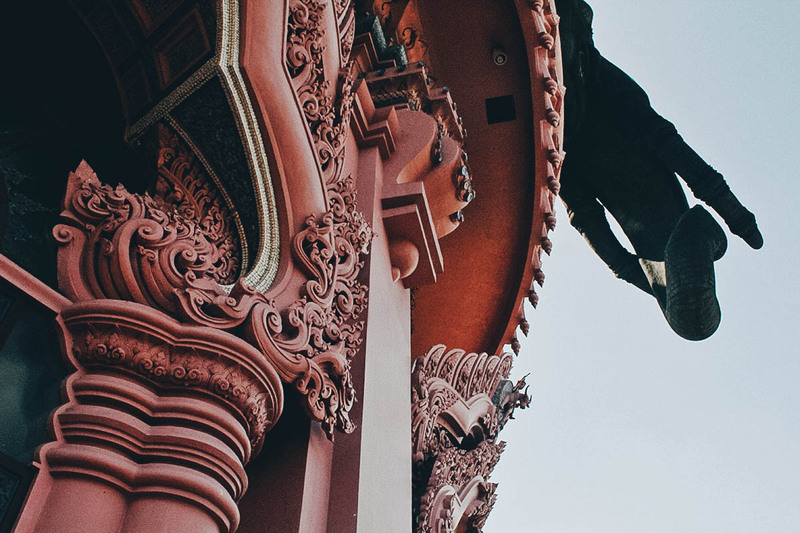 The carvings on the pink pedestal are beautiful. Here are more of those elephants with sound effects I was talking about earlier. 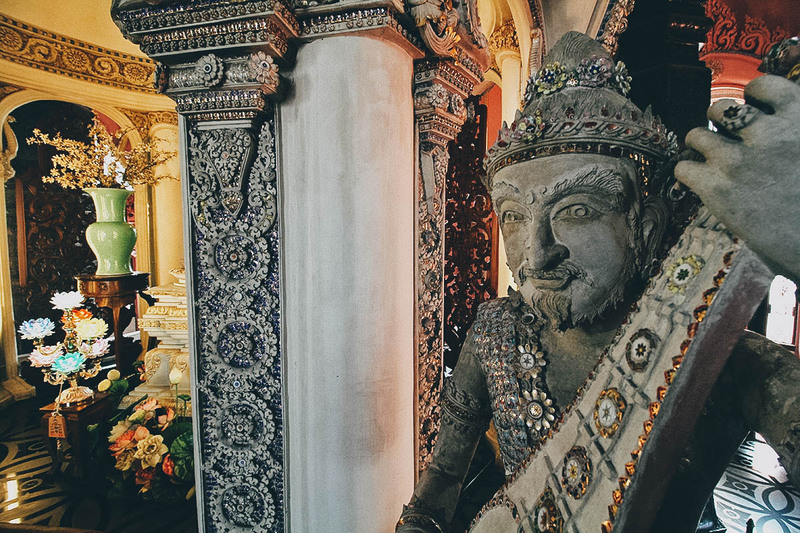 As described, I like visiting unusual places so I enjoyed my time at Erawan Museum. The sheer size of the statue was impressive. However, the museum is a little farther from Central Bangkok than I thought. It’ll take you at least half an hour to get there from Siam Station. 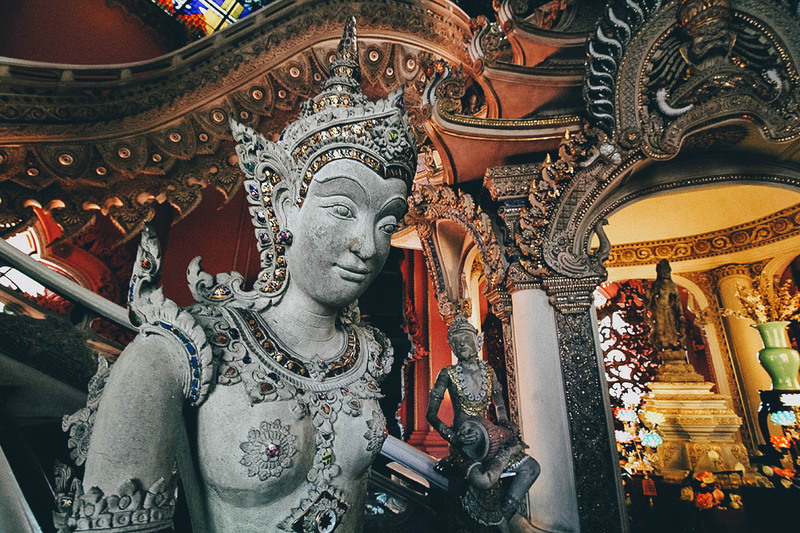 But if you have the time and have already seen all the popular attractions in Bangkok, then this is a great place to spend a couple of hours. Apart from the giant statue, the amount of detail inside the museum is stunning. You can purchase your tickets at the gate or buy them in advance through Kkday. I’m a big fan of Kkday and use them often to find deals when we travel, but tickets to the museum seem to be THB 45 more expensive on Kkday (THB 445). 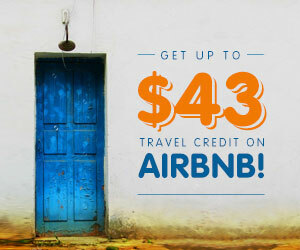 Surcharge I guess? In any case, I just checked the museum’s website and it looks like they’re running a promo where adults can get tickets for just THB 300 apiece. Take the BTS SkyTrain to Samrong Station which is the last stop on the Sukhumvit line. Exit the station and take a taxi or Uber/Grab to the museum. I took Uber and paid a little over THB 54 in October 2017. 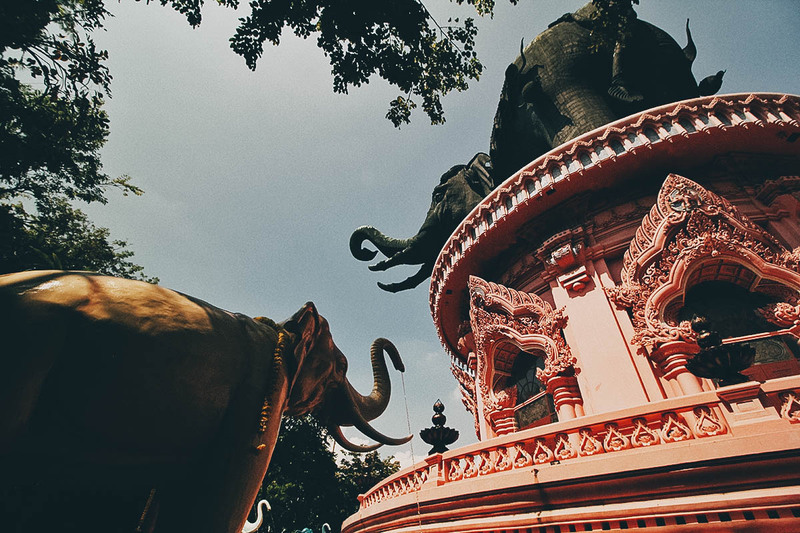 Kkday sponsored my entrance ticket to Erawan Museum in exchange for an honest account of my experience. They didn’t tell me to visit this place. 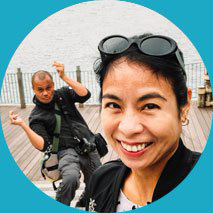 I went through their site and chose this one on my own volition. As always, all words and opinions expressed in this post are mine and mine alone.